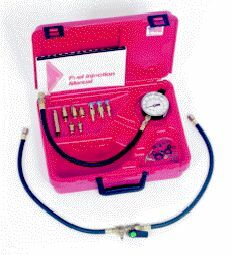 This in-line tester enables the Technician to find bad fuel pumps, bad pressure regulators, leaking injectors, and clogged fuel filters. The 2-1/2" gauge has a dual scale dial with ranges from 0-100 PSI and 0-7 bar. Hook on gauge enables the Technician to hang up gauge and hose assembly to free his hands. Adapter Specifications: M8x1.0 F adapter, other end M12x1.5; M10x1.0 F adapter, other end M12x1.5; M8x1.0 / M12x1.5 with o-ring; M10x1.0 / M12x1.5 with o-ring; M8x1.0 / M12x1.5 with o-ring; M8x1.0 Banjo bolt assembly, M10x1.0 Banjo bolt assembly; M12x1/5 Banjo bolt assembly.